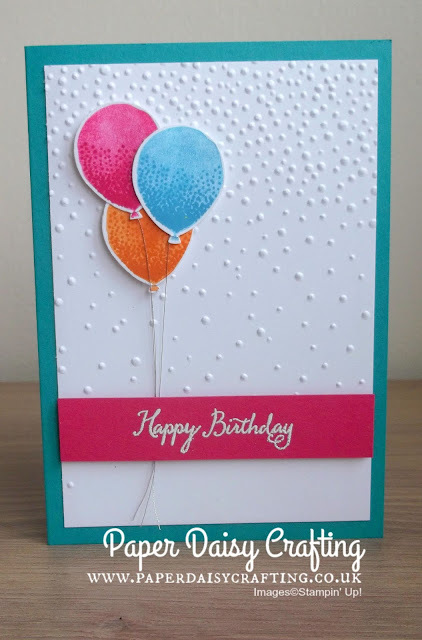 I'm back today with another card made with the Balloon Celebration stamp-set and the coordinating Balloon Bouquet punch from Stampin' Up! There is also a video over on You Tube showing you exactly how I made it (scroll down a bit for the link!). 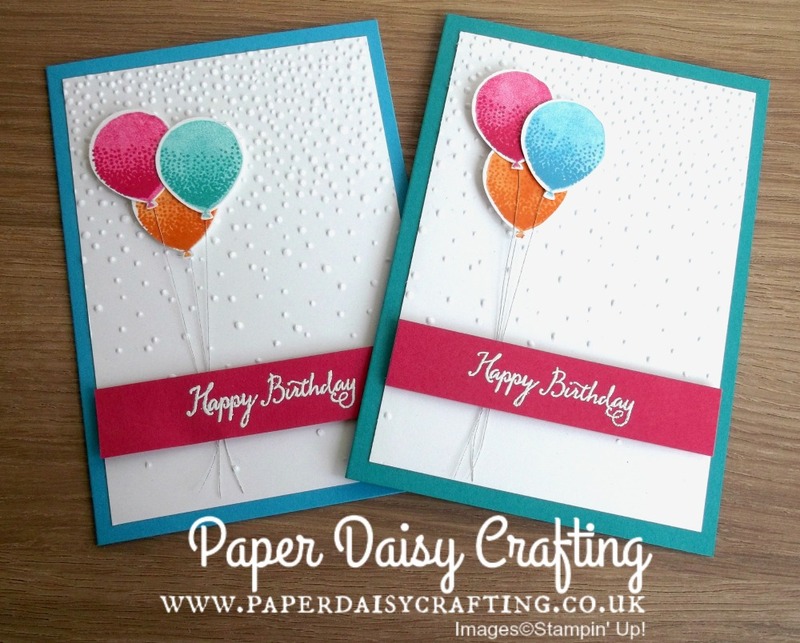 Using the stamp set with the punch makes it so easy to make these lovely little balloons. And there's my favourite embossing folder again - Softly Falling. And you'll be pleased to know that nearly all of the products I have used will be available for at least another year. The only things retiring are the Tempting Turquoise cardstock and inkpad. Tempting Turquoise has been one of my absolutely favourite colours so I'm very sad to see that going. 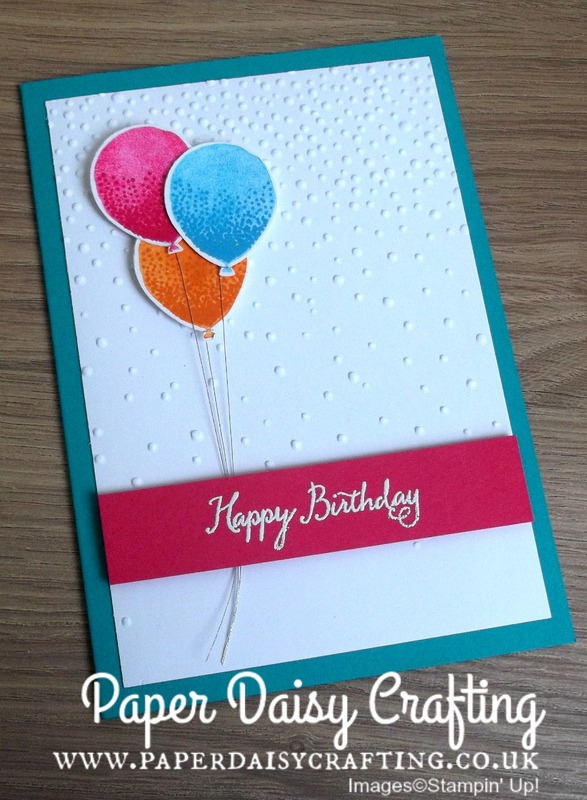 My video will give you more details of how I made my card including a couple of handy tips - one for how to stamp the balloons and another for how to tie the silver thread around the necks of the balloons. So have a watch HERE if you have time, or click on the image below. If you watch the video and enjoy it, please think about subscribing to my channel - I only need a few more to reach 2000 subscribers! Card blank 8 1/4" x 6", score at 4 1/8"
White panel 3 3/4" x 5 1/2"
Pink panel 3 3/4" x 3/4"
Hope you like this card. Back tomorrow with another balloon birthday card.